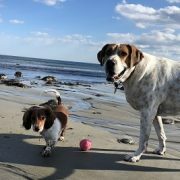 Taylor is a local Newburyport writer helping to cover happenings within the Newburyport High School community. 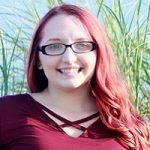 Taylor will be majoring in English at Worcester State University in the fall of 2018 and has participated in creative writing clubs. Newburyport High School Prom is always a time of excitement and fun! It’s a wonderful tradition that students prepare for, weeks in advance. The 2018 Newburyport Senior Prom was held Thursday, May 31st and the festivities started at 5 PM with the annual promenade. 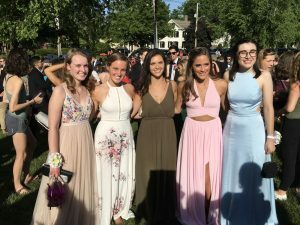 The Promenade always takes place at Newburyport High School before the prom in order to include everyone in this memorable event. Students (who so chose) name’s are announced as they walked down the steps of the high school and then continue down a sidewalk lined with people. Friends, parents, younger & older siblings, other family members, and many from the community come out to be part of this exciting nigh for the students. After the Promenade, students take photos with friends and family and then are transported to the prom on buses. This year’s prom was held at Blue Ocean event center in Salisbury. Traditionally, at a prom students were expected to wear formal attire. Male students wore a black tux with a tie or vest that corresponded in color to their date’s formal gown. Now, with today’s society evolving faster than ever, students, especially girls, are encouraged to express themselves, as they so choose. You will still see lots of formal dresses but you will also see some wearing outfits that stray from traditional gowns, like jumpsuits and even two piece fashions. Meanwhile, boys are wearing different colored suits and switching up their formal attire. Not only are students more expressive with their attire, but there is far less pressure to attend the Newburyport High School Prom as a traditional couple. You will see groups of girls, groups of guys and LGBT couples too. 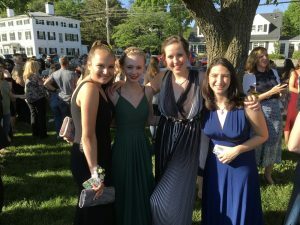 Newburyport High School students are attending prom with friends that they want to make memories with. Newburyport High School senior Isabelle Bacon said, “As a member of the LGBT community, I have personally noticed that our community has become more accepting, because our society has grown in awareness that not everyone is the same.” The Newburyport High School seniors are a diverse group of students but they are ready to celebrate their many wonderful accomplishments as they prepare for exciting future endeavors. Newburyport.com enjoyed helping to capture this great group of students and we hope you enjoy our video of the Newburyport High School Prom Promenade. Make sure to follow Newburyport VIP on Instagram to view our VIP Prom photo highlights.